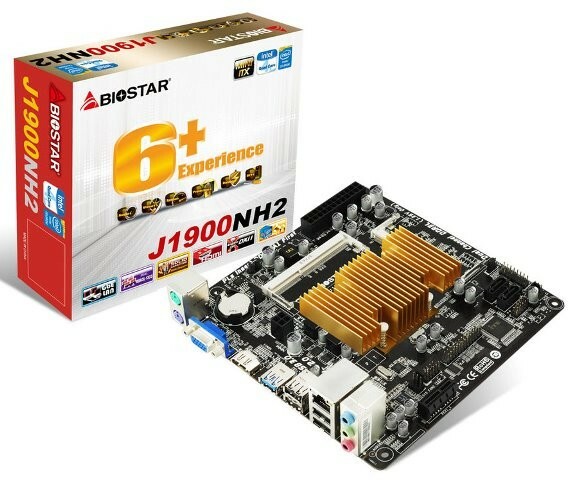 BIOSTAR recently announced the J1900NH2 motherboard with the on-board Intel Quad-Core Celeron J1900 processor, using a mini ITX form factor with a size of 17x17cm, builders are able to make creative designs for many different uses. The BIOSTAR J1900NH2 boards come with the Intel Celeron J1900 Quad-Core processor already installed and it supports two DDR3L 1333/1066MHz memory slots for a maximum of 16GB of memory. With the integrated GPU, watching HD content and playing games is no sweat. Check out the rest of its features and specifications below from the official release announcement. The X.D.C (eXtreme Durable Capacitors) is quality solid capacitors to help make sure the board remains rock solid and stable. These are low ESR and high ripple conductive solid state capacitors that provide a stable power supply to the CPU. The life span can also be more than 6.25 times that of ordinary liquid caps. Not only that, this board features “Moistureproof” PCB design. That means that you can setup an outside kiosk or signage and even in rural or coastal areas with high humidity the board will be robust. The boards feature the latest BIOSTAR technologies such as BIOS Flasher and BIOS Online Update for easy updating and restoration of the BIOS, as well as BIO-Remote2 for remote control of the system via Android and Apple devices. BIO-Remote2 Technology gives users a better Home Theater environment. Users who own either Android or Apple mobile devices are able to access and control the PC remotely. You’re smart device can become an intelligent and functional remote control. Moreover, BIO-Remote2 also includes both the function of mouse pad and power point presentation modes. The BIOSTAR J1900NH2 also features the Charger Booster function. It is a high powered charging solution for Apple or Android devices such as iPad, iPhone and Android phones and tablets. Charger Booster Technology is able to boost the charging time of any mobile device when connected to the motherboard. With Charger Booster Technology, you are able to charge your devices up to 42%. Faster, making it much more efficient.